I don't normally do posts like this but this week has been a little hectic, between the tires, work and packing for our mini vacation! That is right I am going on a long weekend getaway to see my SIL, BIL and two super cute twin nieces in ATL. (Can I use anymore abbreviations???) While we are down there I hope to hit up a few bakeries and hopefully they will let me take some pictures and I can share my findings with everyone. But in the mean time I have a small giveaway for you! I was recently given the opportunity to try some chocolate. And everyone should know by now that I will not pass that up. 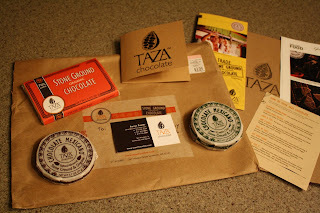 So the wonderful people at Taza Chocolate sent me a few bars of chocolate, and their 70% Bar alone changed P into a dark chocolate fan which is a feat unto itself. But in all honesty I consider myself some what of a chocolate connoisseur, each chocolate has its place in the world, from Hershey's to this wonderful Taza. And I have tried a lot of different chocolate bars, I don't feel the need to name drop so you will just have to take my word on it. But I can honestly say hands down this is the best dark chocolate bar I have ever tasted. Its wonderfully fruity and sweet in a good way. Most dark chocolate has a bitter component and if that is a large component then that bar of dark chocolate is not for me. But this chocolate is and bonus that it's artisanal and organic. And to show you how much I really like this chocolate, I will be giving away one bar of their 70% Chocolate. That is right I am going to purchase a bar of chocolate just for you! Purchase you say....Yes because I ate all of the chocolate they gave me and must have more so I figured why not share with all of you! So Please leave a comment and a way for me to contact you. I will be picking a winner Monday March 9th at 8am CST! Yes that is it just a giveaway, no recipe to use the chocolate in. I ate it all before I could even think that far. If you would like to check out Taza please click HERE! And they are running a contest now that you can win a box of their wonderful chocolate. So if you have facebook then I would suggest you go HERE and enter. And as a side note I love the Mexican Chocolate as well the texture it has is fantastic and the two they sent me were out of this world good. And the spicy one wasn't that hot which is nice for a lightweight like me. I have to get their Vanilla Bean and Cinnamon. Me me me! Choose me! Oooooh, please count me in! I'm definitely interested in checking Taza out! I know the chocolate from Modica is quite grainy, too, so I'd love to compare them. Thanks for the opportunity! I would of eaten it all too! Oolala, free chocolate? I'm in! I love the artisan dark chocolates made from Mexican beans too. Can't blame you there, I would have inhaled it myself! free chocolate? how could i resist? 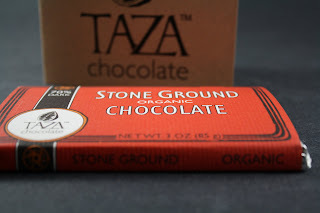 i've never tried Taza chocolate; it sounds delicious! delicious dark chocolate is for me! me too please! sounds wonderful! I only recently discovered that I really enjoy dark chocolate--I just tolerated it before, I thought. But man, I am so into it now! as dark as you can get, baby! Sign me up !!! I am heading to FB now!! Cannot wait to learn more about them!! Pick me Pick me! 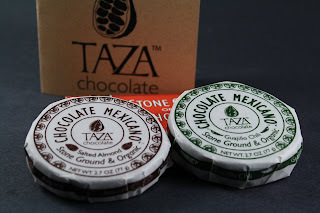 Love chocolate and have never tried Taza! Oh how I would die for some chocolate right now. I haven't had chocolate in awhile. Chocolate deprivation, much? I also like Mexican chocolate. Mexican Hot Chocolate pretty much rules in my book. If you like chocolate, you should make orange truffles using Tang. I found a recipe awhile ago on foodgawker, and they were devine. I love chocolate and baking with chocolate. Yay again for the Atlanta trip!! Don't forget to let me know how it goes! This chocolate must be amazing for you to say "best" dark chocolate bar. I am uber-intrigued/hungry! Hello, my name is Steve. I was a recovering chocoholic until now. Chocolate. Must. Have. Chocolate. Please help? Much grass. thanks for the heads up on the new chocolate -s ounds great! Love dark chocolate especially in baked goods!! Those little disks of Mexican chocolate look interesting. The best dark chocolate you've ever had? I've got to check it out! i gave up dark chocolate peanut m&ms (my fave) for lent so this would certainly help me make i through to easter! Ooh, I'll try for that one! YUMMY Giveaway! would LOVE to try it! Oooh, I love chocolate! I'll trade you my recipe for nookie cookies (aka orange-chocolate chunk cookies). Make me a believer... we've already got a fave bar (Equal Exchange 70%) but are always up for trying new ones!